About Michelle Craig: I am a married mom of 3 kids in Dallas, TX. I am a proud supporter of the lgbt community. I am also a supporter of a women’s right to choose what she does with her body. Contact: misha082581@gmail.com, on facebook, and on the web. The empowerment of birth. How one can connect within themselves during childbirth. The emotional toll it takes on women. Pregnant family’s of all backgrounds straight, single, gay, trans, lower income, all deserve to have a support team. They deserve to have the right to information regarding procedures, the right to quality care, and they deserve the right to have unconditional love and support through their journey! I believe that all people no matter what back gourd deserves the right to a informed, empowered, and supported birth. Because if you are connected to your birth then you have a better chance at being an amazing parent. I love being apart of something so spiritual and scared in someone’s life. Empowering them to believe in themselves. That everyone deserves the right to have a supported and loving team during labor. As well as a right to informed decisions. About Jasmine: Jasmine is a doula in Denver, Colorado. In her free time, she likes to dance, garden, and write for Mother Wild Zine-Blog. 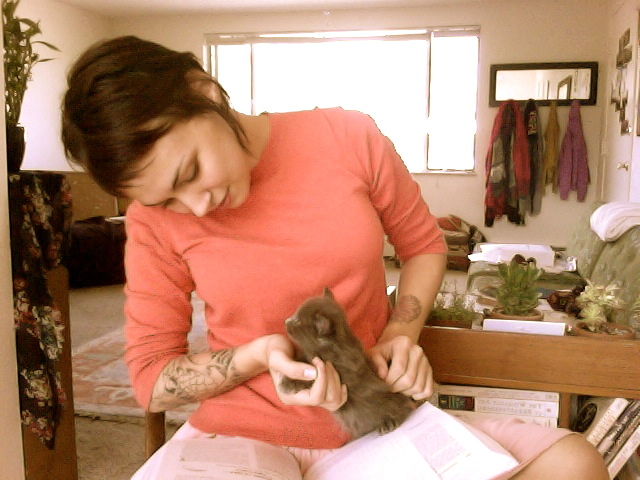 She works as a massage therapist and is studying midwifery, women’s studies, and herbalism. Jasmine is a member of Colorado Doulas Association (CDA), Colorado Midwives Association (CMA), and Midwives Alliance of North America (MANA). She is also a member of the low-cost doula program through the CDA working with low income families. Find Jasmine: On the web, and on facebook. A transformative and empowering birth experience is what inspired me to become a birthworker. I remember weeping weeks after the birth of my daughter remembering how sterile and eerily silent the labor & delivery unit was – I was the only woman moaning through contractions, the only woman to experience a natural birth in that hospital in a very long time (said the nurse). I felt heartbroken thinking of how sad the current system is. Birth is a biological process that is to be deeply respected. Women’s bodies and the mother-baby experience of birth can be so powerful when left alone to blossom in its own time, in its own way. 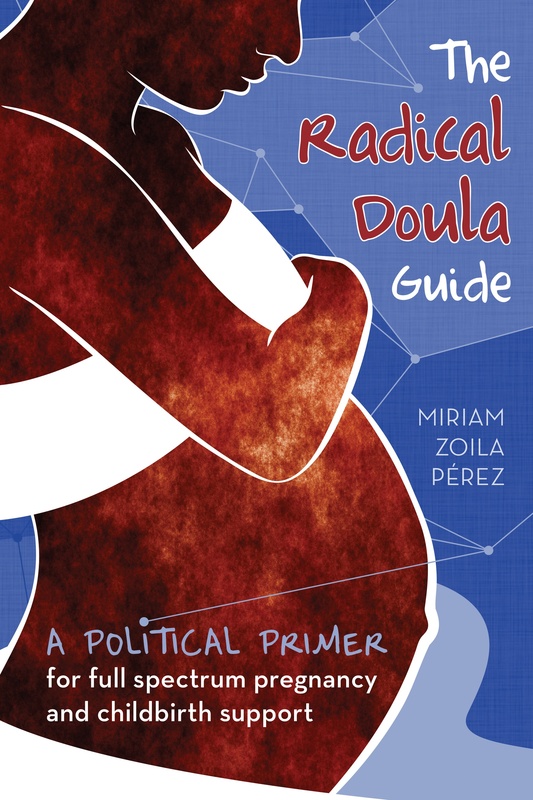 I suppose I identify with the term “radical doula” because I’m somewhat radical in my approach to social activism, not only in the world of birth, but in human rights as well. Along with being a mom and a doula, I’m a massage therapist, student midwife, “placenta enthusiast,” amateur herbalist, and all-around birth geek. I’m also currently pursuing a degree in Women’s Studies because I feel birthworkers should know about all of women’s issues, and not just the realm of reproductive health. I run a blog and magazine and love to get involved in the street art scene (painting quotes about women’s empowerment and midwifery). I personally believe childbirth has the power to transform women and families on some of the deepest levels. As care providers, we either assist or hinder that transformation by either respecting or disrespecting her autonomy. I’m a firm believer in informed choice and the “live and let live” philosophy, meaning every birth is as unique as the woman and baby experiencing it – and we should honor that by staying present, mindful, and aware of her special desires. I’ve attended both home and hospital births, both unmedicated and medicated, both physiological and induced births – and the one thing I’ve noticed they all have in common, no matter how a labor and birth unfolds, is that families come together with strength and grace and a beauty all their own. I believe in my heart that when we celebrate new life, when we connect, laugh, weep, and rejoice – we realize what it means to be human. After all, why hush ourselves? We’re alive. I would remove the fear of birth from women’s hearts and minds. I’d love to see a world where women looked at birth as a creative and intensely beautiful rite of passage. About Louise Powers: I am a Doula & Qi Healer. I have studied many religions and philosophies and I have a deep respect for the value of all faiths and cultures. Through marriage and adoption I have family on 4 continents, living in and coming from many different countries. I completed Birth and Postpartum Doula Training through DONA International and I am training through CAPPA as well this year. I continue to educate myself on the subject, of birth and child care. I have been learning about birth and infant care since I was 13 and my mother was having my little brother. I became very involved in the process with my mother. We researched everything we could about pregnancy and newborns. I helped her as I have helped many new mothers for over 20 years now. It has become both a passion and a rewarding way to help others. I identify with the term radical doula because I believe in women making choices for themselves & that each woman deserves nonjudgmental support. Although this should not be a radical idea, every day I hear about more women who are judged for their choices. I don’t want other people to judge me. Why would I judge you? Seeing women believe in themselves & connect with their own personal power. I would stop women from passing judgement on each other. 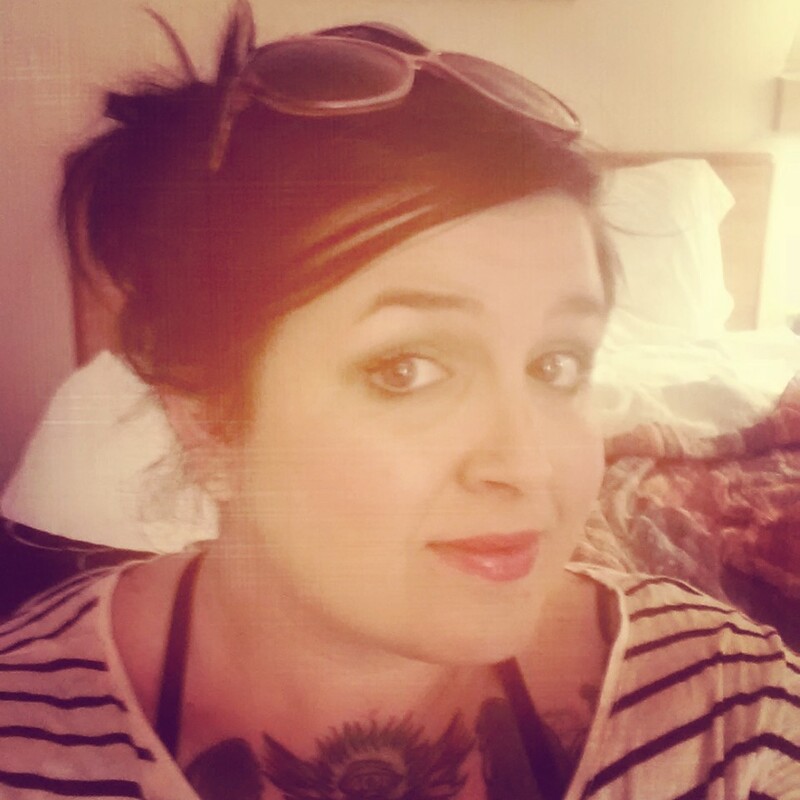 Gracie Dillon-Moore, a radical doula in Knoxville, Tennessee has a double degree in women’s studies and psychology. Intrenched in the psychology of pregnancy and birth and motivated to assist women in the physiological, unmedicated birth they desire, Gracie became a childbirth researcher, educator, and certified doula. Gracie seeks change in the American woman’s birth experience. She believes education, support and resolve can carry a woman through the birth experience, naturally. Contact Gracie here. My own birth experience inspired me to help other women who desire an unmedicated, natural, physiological birth. I believe this process of birth as nature intended is a springboard to the rest of the mother and family’s life together. I identify with the term radical doula because unlike most doulas and childbirth educators, I choose to work only with women who seek unmedicated births. It may seem exclusionary to some but I find my student’s needs for information and support on giving birth naturally are sugar-coated and often dumbed down by those trying to honor all types of birth (which of course is necessary, too). If you are seeking a natural, unmedicated birth, you must build resolve, confidence and awareness. Only through respect of your body and the labor process can a woman own and champion an unmedicated birth in the United States. Therefore, I support Radical Mamas, who seek Radical Birth. I am a Radical Doula. My doula philosophy is that every woman deserves support in labor and birth. That support should come from her partner first and her doula second. The doula is the guardian of both mom and partner, meeting their gaze at each glance-offering steady reassurance and unwavering compassion. My favorite thing about being a doula and childbirth educator is the change I witness between mom and partner. During my 12 week course, the partner shifts from passive to active participant in the birth process. During birh, both mom and partner are overcome with the gravity of what they accomplished together. Each time I attend a student’s birth I witness a couple, transformed by th power of their unity; this moment is my favorite thing about being a doula. I would change the dismissive, condescending, threatening, intrusive, disrespectful, non-evidence based “care” women receive in the majority of medicalized pregnancy, labor and birth. I would restore respect in women’s care during pregnancy and birth, encouraging women to tune into their instincts and intuition. About Angela: I am just returning to the doula-world after a five year hiatus. In the birth have worked as a birth and postpartum doula, a childbirth educator, abortion counselor, and residential counselor at a home for pregnant and parenting teens. I have also as a homeless out reach worker, disability rights activist, mental health counselor, and girls-program coordinator at a feminist organization. My doula business is called RaDoula and is open to everyone and works on a sliding-scale. I offer doula services in abortion, pregnancy, birth, and postpartum. I am particularly interested in serving queer, teen, low-income, disabled, in immigrant populations. 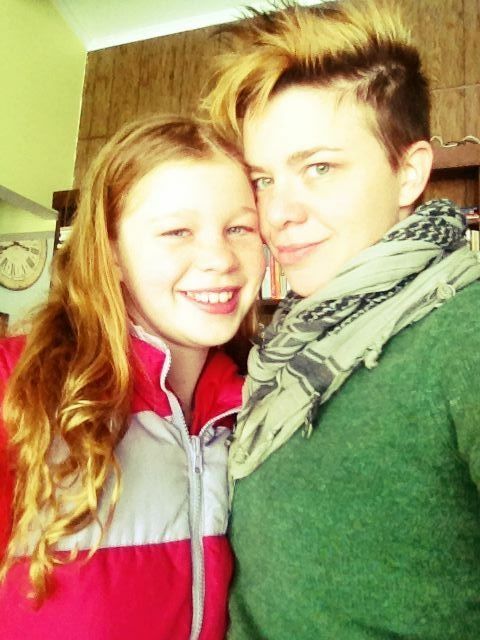 On a personal level, I am a queer, poet, activist, midwifery student, and mama to an 11-year old wonder girl. My dog only has 3 legs but can run faster than you. I started studying midwifery shortly before I became pregnant with my daughter. A lot of midwifery courses suggest or require that you have doula training. Once I started working as a doula, I realized how important the role is in a birth. Additionally, I am very interested in politics, anthropology, and feminism- the three of those things combined along with a nurturing personality lent to me being a natural at this doula thing! I guess I’d have to take a Rebecca West stance on this when she said, “Feminism is the radical notion that women are people.” Radical comes from the Latin world for “root”. Being a radical doula, to me, means that I’m getting at the root of the feminist, the root of feminism, the root of biology… the root of a person and believing in them… and maybe helping them to grow. As a doula the two most important aspects to my services are 1. Providing information to assist in decision making and 2. Offer support and advocacy, regarding the wishes of my client, regardless of my own opinions. This philosophy fits into my very strong political pro-choice beliefs. These beliefs extend beyond choices before/during pregnancy, but also into birth, post postpartum and through out life. I believe that an individual body is that individuals body-period. With that said, I also believe that our society makes a lot of misinformed and uninformed decisions. The pregnancy, birth, and postpartum worlds are all ones with which I am very familiar. I am proud to offer that information to my clients and then support them, no matter what their decision. One of my favorite quotes is “If you don’t know your options than you don’t have any.” I stand by that. The connection and seeing women feel empowered and POWERFUL! Well, I don’t have a problem with BIRTH, per se, but the medical system that has taken over the birth process and changed it into a business pisses me off a bunch- I would change that for sure. About Cindy: My name is Cindy Collins and I am a native Californian of the San Francisco bay area. I came to Delaware in 1999 by the Air Force. I married my husband, Rodney, in 2001. After I separated from the Air Force I attended culinary college in Baltimore and received my degree in professional baking and pastry. I worked for a several years in the restaurant business, also teaching baking courses at Polytech on occasion. For over 10 years I planned to open a coffeehouse and bakery however, God had another plan for me. In fall 2005 I gave birth to my first son, Reed. During my pregnancy I became quite interested in natural childbirth. I became a Certified Breastfeeding Peer Counselor with WIC when my son was 7 months old and worked for 2.5yrs for Bayhealth. During my second pregnancy, my passion for birth and midwifery grew immensely. It was then I realized God was calling me to become a “birth worker”. In spring 2008 I gave birth to my second son, Jonas. In spring 2011, I gave birth to my third son, Silas. My own birth experiences have varied from a planned birth center birth turned hospital induction, a speedy birth center birth and a waterbirth at home with midwives. I am grateful for my own diverse birth experiences. I believe birth can be an enjoyable, transcending, life-changing, painless, and empowering experience. I believe birth is a safe physiological event, not a medical emergency. Birth is inherently safe, interference is risky. I strongly advocate for the use of midwives and out-of-hospital births. I eagerly look forward to serving women during pregnancy, birth and postpartum period! Contact Cindy at Euphoricbirth.com or Cali4niachef@msn.com. My own birth, feeling duped and mislead by birth center midwives was a catalyst. Seeing the results the hospital produced while working own the postpartum floor confirmed I needed to become part of the solution. Going against the grain. I’m richly trained and educated, certified in nothing. I attended my friends planned UC surprise breech birth. I’m bold and always speak my mind, even if it means contradicting a provider. Being apart of moment in history! It’s sacred and special! Birth options, rights and choices for women! Acquanda is a Black Feminist, cultural anthropologist, Certified Lactation Educator (CLE), and ICTC-trained Full Circle Doula, who hopes to one day bring the combination of these to higher education when she’s a professor. Acquanda writes the Lactation Journey Blog, which was created as a space to chronicle her venture in breastfeeding advocacy that focuses largely on inequities among African Diasporic women and the overall community. She grew up in Southern California, the fourth and fifth (she has a twin) of six children, and is also a ‘super auntie’ and ‘othermother,’ who has played a hand in raising each of her 16 nieces and nephews – including her one-year-old great nephew. Acquanda lives in Washington State and is working on her first book – about breastfeeding. Visit her website. I don’t have any children, so a positive or negative birth experience as something that ultimately shaped my reasons for practicing is not part of my story. I have been involved in critical breastfeeding awareness for a while now, to address the staggering health and social issues among Black women, who statistically rank the lowest of any group in this country in initiation and duration. I decided to become a doula because I saw it as a way to extend my breastfeeding advocacy and activism, and figured it would allow me to go deeper as well as provide an additional layer of insight. Initially, my goal was to participate postpartum and interact with women after their birthed and were home or settled, but after attending ICTC’s Full Circle Doula training that is based on a midwifery model of care, I recognized focusing all areas of pregnancy and birth are equally crucial in supporting breastfeeding and challenging maternal-infant mor tality and other social issues linked to this area. I see the injustice in breastfeeding and birth and countless others, that are infused with racism, white supremacy, and various interlocking forms of oppression that have shaped the way Black women, women of color, and many continue to be marginalized and I’m not afraid to challenge them. I don’t know if I have a doula philosophy, per se, but my broader moral and political beliefs shape my views as a doula. I believe in equality and liberation and work towards actualizing these. It’s difficult to narrow it down to just a ‘thing,’ but I really appreciate that for me, being a doula allows me to actively participate in challenging structural violence against Black women, our bodies, families and other areas. Being a doula is an additional tool in challenging a historical legacy of oppression in this country. I like that simply sitting in a room with a woman in labor allows her to have a better birth outcome. And I love that I am helping to build a legacy that will manifest itself for generations; using this platform as an additional tool in challenging social issues means that I may be able to imagine that one day when a woman is partnered with a doula, it is to engage in the tradition for spiritual beliefs or as a rite of passage – something of that sort, and not because social issues make pregnancy and birth a threat on a woman’s life. I’m by far not as tenured as others in the birth realm – in fact, I’m pretty new, but from what I see so far if I could change one thing it would be that birth advocates would bring issues that disproportionately affect the most vulnerable members of society to forefront. From what I see in birth and in breastfeeding, is there is too much idealism that causes many to overlook that issues of race, class, sexual identity and others really determine who is birthing, dying and who even goes home happy. Those issues need to become central to *all* our conversations.